← The Last Episode of "He-Man"
The Howling Hall is “haunted” by a creature that can drive anyone mad with sound and on dark nights the sounds of otherworldly music have been reported by passers by. The “monster” of Howling Hall is actually a creation left behind by the former owner; a musician and wizard named Zann who apparently was obsessed with discovering the magical properties of sound. 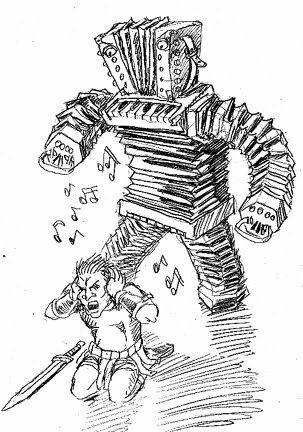 The “monster” is an Accordian Golem — made entirely of animate magical accordians and concertinas. Accordion Golem (unique monster): Move 12″; AC 4; HD 6 (40 hitpoints); 2 attacks 1-6+1/1-6+1; Special abilities: 1/2 damage from blunt weapons, vulnerable to fire, regeneration, sound attack (see below). Because the accordion golem is made up of leather and pliable wood, blunt weapons (like maces and hammers) do 1/2 damage. It can be struck by non magical weapons, but such damage regenerates at 3 hit points per round. If within the area of a silence spell, the golem cannot regenerate damage. Fire damage on the golem cannot be regenerated. Cower in fear for 1d4 rounds. No actions possible. Dance uncontrollably for 1d4 rounds. Can move at 1/2 speed, AC and attacks are at -2; no spell casting possible. Deafened for 1d4 rounds. Is immune to the sound effect for that time, but cannot hear other players either. Confused: will attack random adjacent target for 1d4 rounds. Run away in fear at top speed for 1d4 rounds. Temporarily lose 1d6 points of wisdom (will regain 1 point per day of rest). If wisdom reaches 0, victim dies. Various magical musical instruments are hidden within Zann’s Howling Halls, including a few of Zann’s “Beads of Silence.” These small fragile glass beads can be tossed up to 30 feet away, and, on impact, will create a 10′ diameter zone of absolute silence (as per the spell) that will last 2-5 rounds. There are also rumored to be various other items including a drum that can call down lightning from the heavens, a flute that can cast charm spells, a whistle that can summon a monstrous dog who will serve the whistle owner when blown and various song books and scrolls that contain the formulas for magical musical rites. Zann had a pair of ear plugs which, if worn, made the wearer immune to aural attacks of all sorts (including the song of harpies, the sound effect of the accordion golem, etc.). However, the wearer will be 100% deaf while wearing the plugs (and spells with a verbal component are likely to fail (wisdom check on 1d20) since the caster is likely to unwitting mispronounce the formula). The Howling Halls themselves were one of Mage Zann’s proudest achievements; he concieved the entire structure as a sort of musical instrument and aural environment. Flues are built into the walls to provide ventilation to the deepest cellars, but these flues were also designed to whistle, pipe and moan from the action of the wind, especially when certain doors are either left open or shut. It is thought that one may actually be able to ‘play’ the building like a musical instrument with different combinations of open and shut doors and that the tones produced will have different magical effects. In addition, various halls and chambers are designed to create echoes and sound effects to confuse and frighten intruders, and some of the sound effects are more than just illusions and may actually cause harm to the unwary. Zann himself is rumored to have disappeared many years ago without explanation, although stories say that he was last known to have entered (and never returned from) an upstairs room with a curtained window which the mage would retreat to work on some of his more esoteric musical compositions for viola. Maybe my mother was frightened by a polka band when I was in utero; I always thought accordions were creepy.